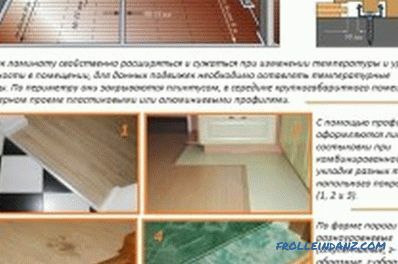 How to lay laminate on wooden floor? Should I do this? Scheme of preparing the base for laminate. Most homeowners remove the old flooring and lay the lamellae on the concrete slab before laying the laminate. Undoubtedly, the method is very reliable, but time consuming. 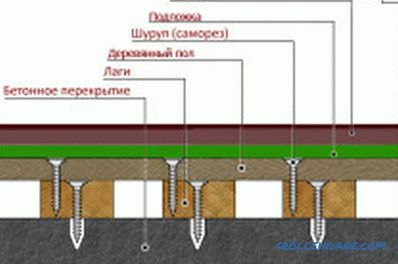 In addition, the concrete base can not be a warm base, so you have to invest a lot of money for additional floor insulation. Today, more often than not, the richest part of the population during repair is trying to lay laminate on the old wooden floor. What you need to know before starting such work? Leveling for laying laminate on wooden floor. If the old wooden floor is creaky and shaky, the laminate flooring cannot be laid on it. The displacement of the boards at the base will necessarily lead to the displacement of the panels, the load on the places of their fixings (locks) will increase, and the laminate will very quickly become unusable. The concrete base is almost unchanged. Wood floor does not have such mechanical strength. 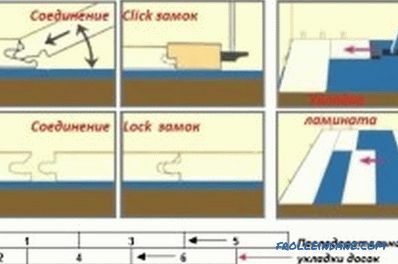 This means that over time the laminate can "float": the panels will disperse, the locks will break. 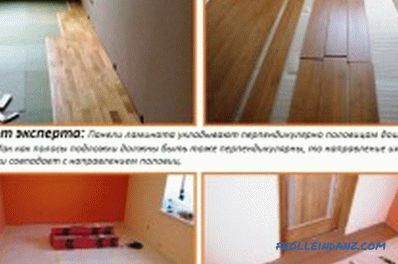 That is why before laying the laminate on the old floor, it is necessary to carry out its diagnostics, repair, and only then build a new coating. The scheme of the nuances of correct laminate flooring on the wooden floor. The job of laying a new flooring will be successful if you follow a strict algorithm. First you need to inspect the old floor. If there are creaky or rotted, failed boards, they should be replaced or secured so that the coating does not creak. If there is a suspicion that the floor frame is not in perfect condition, you can remove the boards in places to make sure that the lags are strong. 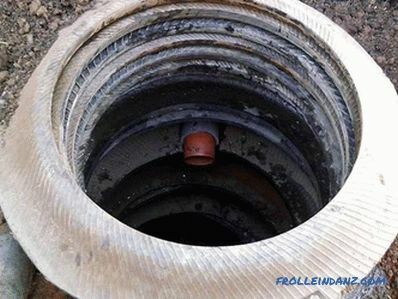 Rotten or sagging will have to be replaced. After that, be sure to check the height difference. 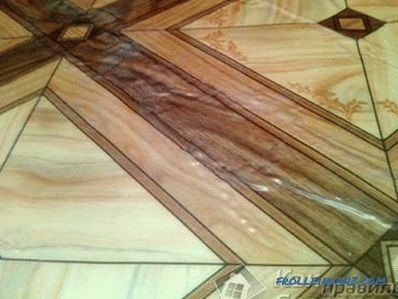 If it is too large, it is better to remove the coating: the laminate will not last for a long time. The old wooden floor has no external damage. There are no "failures" on it, no cracks; boards are tightly fitted, there are no gaps between them. When walking the floor does not creak, the floorboards do not bend. The height difference per square meter does not exceed 1 mm. If all the items are met, laminate can be laid. If not, you will have to start repairing the wooden base. Note: it is better to remove the rotted or sagging floor anyway. Laminate has a long service life, but an unstable wooden base can cause the locks of the slats to become unusable. Laminate panels themselves may deteriorate. If gaps appear between them, moisture will get into them, which is unavoidable during wet cleaning. This will cause the panels to delaminate. Monitoring showed that the foundation needs repair. Here are some tips on how to fix minor flaws. Layout of options for laminate panel layouts. Rotten boards. If the damage is only external, simply remove the board and lay it with the "wrong" side up. If the damage is more global, then it will have to be completely replaced. Floors creak or sag. All boards need to be firmly fixed with screws or nails. Their caps should be drowned deeply into wood: the surface will have to be scratched before laminate flooring. Protruding metal can ruin the electroplane or cycling machine. The boards stagger along with the lags. We'll have to secure the lags. 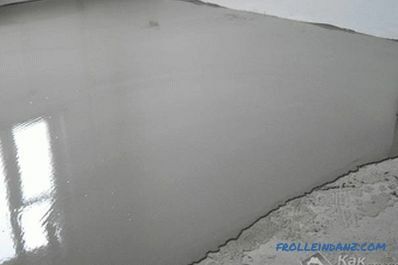 To do this, a hole is drilled in the lag and with the help of an anchor, the lag is attached to the screed. When walking, the floor sags, or the height difference of the coating exceeds 1-2 mm per square meter. We'll have to remove the board and align the frame. Most often for this support lugs are attached to the lags. However, this method is profitable when the lags, although different in height, are in a satisfactory condition. Otherwise, you will have to re-mount the entire frame. There are large gaps between the boards. To cope with them is simple: it is enough to fill all gaps with foam. As a result of all the manipulations, a stable, ideally horizontal base should be obtained (this is checked with a level or level). 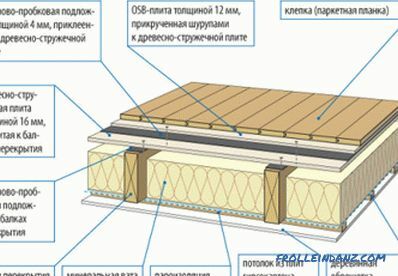 A parallel assembly scheme for two rows of laminate. 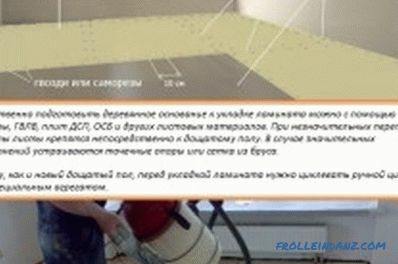 If the level indicates that the height difference is in the range of 4-6 mm per square meter, then before laying the laminate flooring will have ottsiklevat. This should be done by dividing the floor into small sections. After processing each carefully check its horizontal and always the quality of the ground surface.When the whole area is processed, check the horizontal position again, but already in the whole room at the same time. Note: Multiple, but not very large board irregularities can be removed with emery cloth. If there is no looping machine, it will be replaced by an electric plane. 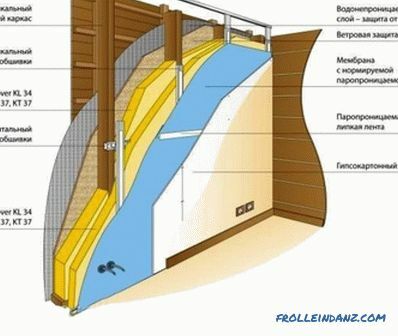 You can level the wooden floor using chipboard or plywood. It is important to remember: the thicker the substrate, the more reliable the final coating will be. In any case, plywood thinner than 15 mm is not suitable. Before laying, sheets are treated with fungicides and anti-mold impregnations (if they are not done in production). In this case, the order of operation will be as follows. Level the subfloor by placing wooden or plastic wedges under the logs. Lay the plywood, carefully controlling the horizontal position. If necessary, under the sheets enclose slats. Attach the sheets to the base. Scheme of ways to design temperature gaps. Sheets are fastened so that the seams between them do not converge in one place. What should I do if old floors are completely unusable, if the height difference is visible without special appliances? Is it possible to level such a floor? 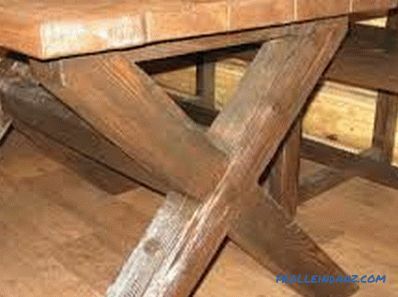 It is best not to do this: there is no guarantee that rotten boards will hold onto the new surface. In the most extreme case, you can try to lay chipboard, OSB or plywood on the old lags, but experienced builders do not recommend it. It is best to completely remove the old floor, make expanded clay filling, reinforce it with a grid and build a new screed. And already on it to lay plywood. After all the work, all dust should be carefully removed. The base is ready, you can proceed directly to the installation of the laminate. Many manufacturers claim that the substrate under the laminate can hide all the irregularities. This is not true. 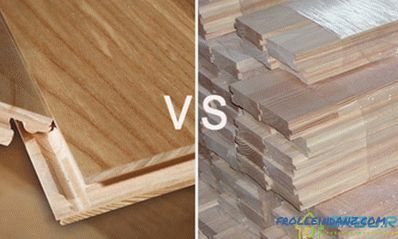 In addition, the choice of the correct substrate depends on the heat and sound insulation of the floor. The order of work will be as follows. Before laying the laminate on a previously prepared base, its (base) is carefully covered with polyethylene for more reliable waterproofing. Lay the substrate. It can be polyurethane foam, polyethylene foam, cork, bitumen with interspersed cork. Any substrate is laid end-to-end and necessarily glued with construction tape for fixation. Removes all dust that has formed. The preparatory stage is over. You can lay lamellae. Laying Layer of Floor Coatings. The laying starts from the far end of the room. You need to make sure that the lamellae lie flat horizontally, and the locks snap into place tightly. A technological gap is left between the wall and the first board. Usually it is 7-10 mm. Laminate flooring. Its panels are constantly expanding and contracting, and the gap allows you to maintain the desired distance for this "swim." 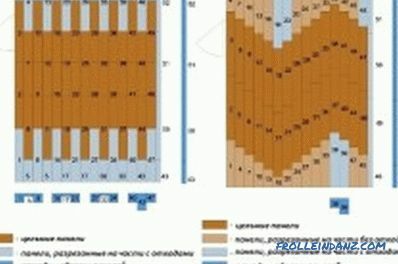 So that the seams between the panels are not noticeable, they are placed in a row, ie, each successive row is shifted. If desired, you can lay the laminate with a Christmas tree or another pattern, but these methods are very expensive: a lot of material goes into trimming. The second row is collected in the same way as the first. If necessary, so that the rows are denser, they are hammered with a special hammer. So continue until the whole room is covered with laminate. The last row is laid with a clamp. Still in doubt, is it worth it to lay laminate on the old floor? If you correctly evaluate his condition and spend all the work, based on the above tips, the new coverage will last a very long time. If there is no certainty that the technology will be fully respected, (perhaps, not enough skills), then it is better to invite professionals. In this case, you have to pay money, but the quality of work will be guaranteed. It is easy to build a table in a bath with your own hands. Materials for the table use different, often take those that are on hand. Used wood has a number of requirements.